At the time of Spanish contact in the sixteenth century the Maya were not a single, unified political or cultural entity, but rather were composed of competing as well as allied city states and kingdoms, many of which spoke mutually unintelligible Mayan languages, including Quiche, Tzotzil, and Yucatec. Thus, to avoid overgeneralizations it is important to specify particular Maya cultures when mentioning sixteenth-century accounts. Aside from the sixteenth-century contact period, documents written in Spanish and Mayan languages, there is the rich corpus of texts and imagery pertaining to the Classic Maya (c. 250–900 C.E. 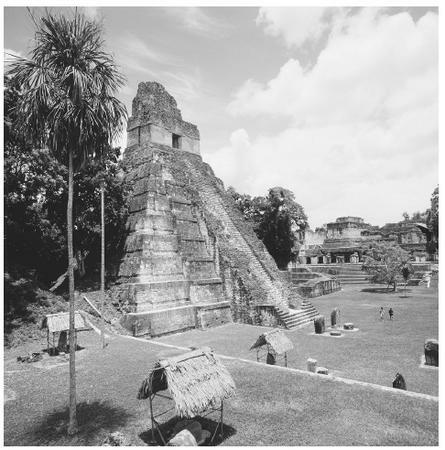 ), much of which can be read and interpreted for a detailed look at Maya religious practices. One of the most important sources concerning the contact period is the Relación de las Cosas de Yucatan, (Account of the Things of Yucatan) written by the Franciscan Priest Diego de Landa in the 1560s. Landa described in some detail the burial customs of the Yucatec Maya, including a period of fasting and mourning, especially for the husband and wife of the deceased. The corpse was wrapped in a shroud, with maize gruel and a precious bead placed in the mouth. The body was then interred in the house floor, which then was usually abandoned. Landa also noted that people of high rank were often cremated. In this case, the Mayan elite may have been evoking Central Mexican burial practices. Although cremation is generally rare in the Mayan region, it is well documented for the Aztec. According to Landa, the bead placed in the mouth would serve as money in the afterlife. However, it is more likely that the stone signified the life spirit, as in the case of the Aztec, who considered the mortuary bead as the symbolic heart of the deceased. In a description of royal funerary rites in highland Guatemala, the Dominican cleric and chronicler Fray Bartolome de las Casas noted that a precious bead was passed before the mouth of the dying king to capture his expiring breath soul. In ancient Maya art, this breath soul is commonly portrayed as a jade bead or flower floating before the face. Moreover, one of the more common death expressions appearing in Classic Maya texts concerns the expiration of a floral breath soul. Mayan Temple I is characterized by multiple steps and located at the religious site of Tikal in Guatemala. Aside from the planting and growth of corn, the dawn rising of the sun was another basic metaphor for resurrection and rebirth in the Maya religion . sixteenth-century Popol Vuh (a text concerning the mythology and history) of the Quiche Maya of highland Guatemala gives a very detailed description of the underworld, here known as Xibalba, or "place of fright." The lords of Xibalba were malevolent gods of death and disease who, although deceitful and cunning, were eventually defeated by a mythic pair of hero twins. Many mythic episodes of the sixteenth-century Popol Vuh, including Xibalba and the hero twins, are present among earlier Classic Maya. Perhaps because of the abundant death imagery on Classic Maya vases, scholars have often assumed that hellish Xibalba constituted the only afterlife destination. However, one of the more common classic period themes concerns the hero twins reviving their father, the maize god. In Classic Maya thought the burial and resurrection of the deceased was compared to the planting of the moribund maize kernel, temporarily buried but destined to reemerge. One extraordinary carved vessel, commonly referred to at the "Death Vase," portrays both metaphors of death and resurrection. On one side of the vase three anthropomorphic cacao trees rise out of the skeletal corpse. The central tree is clearly the Maya maize god. The opposite side of the vase portrays the maize god as a supine, bundled corpse. Floating directly above the corpse is a solar disk, quite probably denoting the ascension of the soul into the sky. In Classic Maya art, deceased kings are commonly shown in solar disks or apotheosized as the sun god. Given the identification of the Maya sun god with war and warriors, the Classic Maya may have conceived of a celestial paradise similar to that of the later Aztec, a brilliant, flower-filled realm of heroic kings and warriors. Coe, Michael D. "The Hero Twins: Myth and Image." In Justin Kerr ed., The Maya Vase Book. New York: Kerr Associates, 1989. Tedlock, Dennis. Popol Vuh: The Mayan Book of the Dawn of Life, revised edition. New York: Simon & Schuster, 1996. Tozzer, Alfred M. Papers of the Peabody Museum of American Archeology and Ethnology, Harvard University. Vol. 18: Landa's Relación de las Cosas de Yucatan. Cambridge, MA: Harvard University, 1941.